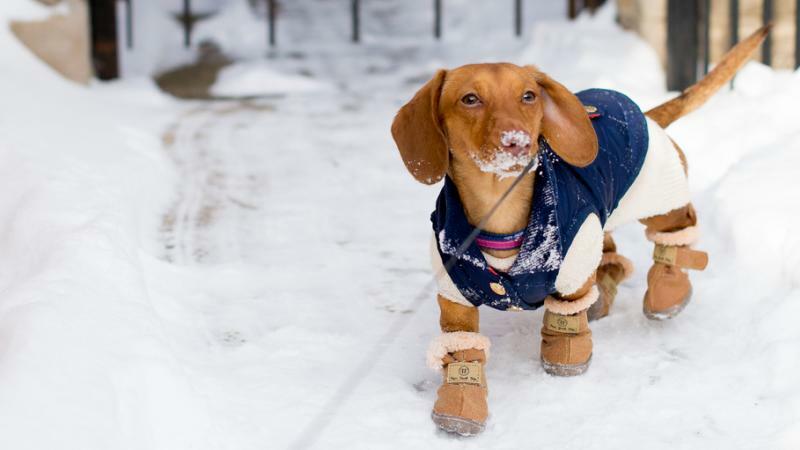 Your pet may have a built-in fur coat, but that doesn't mean they are any less prone to the severe effects of the cold. In fact, when the body temperature of a dog or cat drops below the normal range of 100-102.5°F (with an approximate +/- 0.5 degree differential), they begin to suffer from hypothermia. If left untreated, it may lead to coma, heart failure and death. Additionally, frostbite may occur as blood flow to the extremities (limbs, feet, ears, etc.) of animals suffering from hypothermia is restricted in order to preserve the vital organs (brain, heart, kidneys, liver and lungs). Watch out for the initial signs of hypothermia in dogs and cats such as paleness and intense shivering, especially if your pet is older or sick. Whether it's from a spill while topping off your car's radiator or from a leak, antifreeze (coolant) is a danger to pets. Antifreeze, which is often sweet in taste and brightly colored, contains an ingredient that can be fatal to dogs and cats if not treated immediately after consumption - ethylene glycol. According to the Pet Poison Helpline, there are three stages of antifreeze poisoning in dogs and cats: 1) Drooling, vomiting and signs of walking "drunk" occurs within 30 minutes to 12 hours. 2) Clinical signs seem to "resolve" despite severe internal injury occurs within 12-24 hours. 3) Acute kidney failure and possibly seizures or coma between 12-24 hours for cats and 36-72 hours for dogs. Many pets like to warm up in the winter by snuggling up to the car exhaust of an idling car or, for some cats, under the hood of the car. This poses several threats. Pets may be inadvertently run over by the car once it starts moving, or get tangled up in the engine's parts. Carbon Monoxide poisoning is another hazard for pets if the car is left running with the garage door closed. Avoid tragedy by always checking under the hood and under the car when returning to a car running idle, and never leaving a car running in a closed garage. Ice-melting salts not only irritate and chap your pet's paws, they can also poison your pet if consumed in sufficient quantities. According to the Pet Poison Helpline, "salt poisoning in dogs and cats results in clinical signs of vomiting, diarrhea, inappetance, lethargy, walking drunk, abnormal fluid accumulation within the body, excessive thirst or urination, potential injury to the kidneys, tremors, seizures, coma, and even death when untreated." When salting your own driveway and sidewalks, look for pet-safe ice-melting products. Additionally, wash your pet's feet every time they come from outside, or consider buying him or her some cute winter booties. Poisoning from rodenticides (mouse and rat poisons) is one of the most common types of toxicities managed by animal hospitals and veterinarians. These poisons are often used more during the winter, when rodents seek the warmth of our homes and office buildings. Unfortunately, our pets tend to find them too. There are four common active ingredients in mouse and rat poisons: long-acting anticoagulants, cholecalciferol, bromethalin, and phosphide rodenticides. All can be dangerous, even deadly, for dogs and cats depending on the quantity ingested.